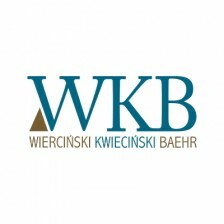 WKB Wiercinski, Kwiecinski, Baehr is a Polish law firm based in Warsaw and with an office in Poznan. The firm was established more than 10 years ago by a group of experienced advocates and legal counsels who had for years contributed to the success of several Polish law firms. We provide top-tier comprehensive legal services for businesses. We introduce innovative legal solutions to quickly respond to changing legal and market realities. We advise Polish and foreign clients and have a broad network of contacts with international and foreign law firms. real estate, environmental protection, employment, energy, public procurement, and competition. We have a track-record of major privatisation projects and complex M&As and can boast a group of experienced litigators. We rank high in foreign legal directories, including Chambers & Partners, Legal 500 EMEA, PLC Which Lawyer? and European Legal Experts, and in industry rankings published by Polish dailies, such as Rzeczpospolita.